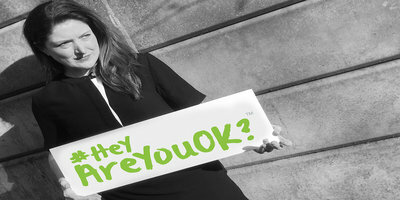 ‘Hey, are you OK?’ Four easy words at the core of a campaign aimed at the heart of communities, workplaces and schools. The #HeyAreYouOK? Social Change Campaign, aiming to improve attitudes and culture in response to stress and distress, comes from the team at STORM® Skills Training, a not-for-profit social business. The STORM team visited GSS to deliver their simple and effective three step approach. 2. Look out for each other. 3. If you feel able, offer help and support. The campaign stems from STORM’s long history of work around suicide prevention. The team wanted to have an earlier impact, before suicide becomes an option. They developed the #HeyAreYouOk? campaign to help change attitudes to stress and distress, which if left unacknowledged can lead to thoughts of suicide. In these times, we are becoming increasingly aware of the economic and personal impact stress has; we also know that the highest rates of suicide are seen in males aged 45-49 and most men of this age are in the workplace. It’s very powerful to think that four simple words, ‘Hey, are you OK?’ can have such an impact. To learn more about the campaign or find out what opportunities are available to your team , visit http://www.stormskillstraining.co.uk/ or follow the campaign on twitter. For more info, and to find out how we can benefit you please contact us.